An execution plan describes what's going on behind the scenes when SQL Server executes a query. It shows how the query optimizer joined the data from the various tables defined in the query, which indexes it used, if any, how it performed any aggregations or sorting, and much more. It also estimates the cost of all of these operations, in terms of the relative load placed on the system. The SQL Server Query Optimizer is perceived by many to be a magic black box, transforming SQL queries into high performance execution plans in the blink of an eye through some unknowable process. The truth is that, while the Query Optimizer is indeed the highly-complex result of decades of research, learning how it works its magic is not only possible, but immensely useful to DBAs and Developers alike. A better understanding of what the Query Optimizer does behind the scenes can help you to improve the performance of your databases and applications, and this book explains the core concepts behind how the SQL Server Query Optimizer works. With this knowledge, you'll be able to write superior queries, provide the Query Optimizer with all the information it needs to produce efficient execution plans, and troubleshoot the cases when the Query Optimizer is not giving you the best plan possible. With over 15 years of experience in the use of Relational Databases (including SQL Server since version 6.5), Benjamin has watched the SQL Server Query Optimizer grow and evolve. His insight will leave you with an excellent foundation in the practicalities of the Query Optimizer, and everything you need to know to start tuning your queries to perfection. This book shows how to use a mixture of home-grown scripts, native SQL Server tools, and tools from the Red Gate SQL Toolbelt, to successfully develop database applications in a team environment, and make database development as similar as possible to "normal" development. Too often as developers, we stop work as soon as our code passes a few basic tests to confirm that it produces the 'right result' in a given use case. We do not stop to consider what other possible ways in which the code might be used in the future, or how our code will respond to common changes to the database environment, such as a change in the database language setting, or a change to the nullability of a table column, and so on. Today, a lot of applications exchange information in XML format. As such, there needs to be an agreement between the sender and receiver about the structure and content of the XML document. An XSD (XML Schema Definition Language) Schema can be used to enforce this contract and validate the XML data being exchanged. With SQL Server 2005 came the new native XML data type, and with it support for a subset of XSD. SQL Server stores XML schemas as 'XML Schema Collections', representing SQL Server objects, such as tables, views or stored procedures. Based on an XSD schema, you can create an XML Schema Collection that can be used to validate an XML data type, variable or column. An XML variable or column that is associated with an XML Schema Collection is known as TYPED XML. SQL Server validates a TYPED XML value against the rules defined in the schema collection. INSERT or UPDATE operations will succeed only if the value being inserted or updated is valid as per the rules defined in the Schema Collection. This book will help you learn and use XML Schema collections in SQL Server. Prior knowledge of XSD is not required to start with this book, although any experience with XSD will make your learning process easier. This book starts with the basics of XML schemas and then walks you through everything you need to know, with examples and labs, in order to build powerful XML schemas in SQL Server. Many of my clients need to make data that lives on one server available on another server. There are many reasons for such a requirement. You might want to speed up cross-server queries by providing a local copy of the data. Or you might want to make the data available to resource intensive reporting queries without impacting the OLTP load, maybe even with an intentional delay so you're always reporting against complete days only. Finally, you might be looking to implement high availability. In all these situations, SQL Server Replication is a viable option to look at when planning for the implemen­tation of such a requirement. With this book, I want to introduce you into the vast world of SQL Server Replication and show you its most important strength and weaknesses. After working through the exercises, you will be able to make an informed decision whether replication is the right feature to use and which type of replication is the most advantageous in your situation. You will also know when to stay away from replication and use other features such as simple log shipping or the new "Always On" feature set. Fundamentals of SQL Server 2012 Replication provides a hands-on introduction to SQL Server replication. The book begins with a short overview that introduces you to the technologies that make up replication. In the following chapters, the book will walk you through setting up different replication scenarios. All hands-on exercises are designed with security best practices in mind. When you're finished working through the exercises, you will be able to implement your own multi-server replication setup while following the principle of least privilege. 15 first-time authors answer the question: what makes you passionate about working with SQL Server? MidnightDBA and Red Gate partnered to produce a book filled with community - tribal - knowledge on SQL Server. The resulting book is a series of chapters on lessons learned, perhaps the hard way, which you won't find in traditional training or technical guidance material. As contributors to a truly community-driven book, the authors are all generously donating 100% of their royalties to the charity Computers 4 Africa. A DBA's core responsibilities are constant. A DBA must have the hard skills necessary to maintain and enforce security mechanisms on the data, prepare effectively for disaster recovery, ensure the performance and availability of all the databases in their care. Side by side with these, our authors have also recognized the importance of communication skills to the business and their careers. We have chapters on the importance to a DBA of communicating clearly with their co-workers and business leaders, presenting data as useful information that the business can use to make decisions, and sound project management skills. The resulting book, Tribal SQL, is a reflection of how a DBA's core and long-standing responsibilities and what it means to be a DBA in today's businesses. Storing large object data in the database offers a number of benefits, but introduces performance challenges. Conversely, storing large object data in the file system has overriding performance advantages, but fails to offer some of the basic data integrity, security and manageability features that are required for business data, and which SQL Server provides. Up to now, most people have adopted file system storage by necessity, and often struggled to overcome the associated shortcomings. This is exactly where SQL Server's new FILESTREAM feature fits in. Introduced in SQL Server 2008, it is implemented as an extension to the VARBINARY(MAX) data type and allows large object data to be stored in a special folder on the NTFS file system, while bringing that data under the transactional control of SQL Server. This book guides you step-by-step through every phase of FILESTREAM implementation, from enabling the feature, to creating FILESTREAM tables, to manipulating FILESTREAM data through the streaming APIs. We also cover, in detail, administration and troubleshooting of FILESTREAM databases and tables. If you've designed your SQL code intelligently and implemented a sensible indexing strategy, there's a good chance your queries will "fly", when tested in isolation. In the real world, however, where multiple processes can access the same data at the same time, SQL Server often has to make one process wait, sacrificing concurrency and performance in order that all processes can succeed without destroying data integrity. The duties and responsibilities of a Database Administrator (DBA) make for a long and dynamically changing list, ranging from offering query tuning advice, to cutting stored procedures, all the way through to system process design and implementation for high availability. A DBA's tasks, from day-to-day, are rarely constant; with one exception: the need to ensure each and every day that any database in their charge can be restored and recovered, in the event of error or disaster. This means that if a database, for whatever reason, gets corrupted, dropped, or otherwise becomes unusable, then it is the DBA's responsibility to restore that database to the state it was in before the problem occurred, or as close as is possible. Of course, this doesn't mean that a DBA is required to restore a database each and every day, just that if disaster does strike the DBA must be prepared to deal with it, regardless of when or why it occurs. If a DBA isn't prepared, and significant data is lost, or databases become unavailable to end users for long periods of time, then that DBA probably won't be in their job for too long. This is why a good, and tested, SQL Server backup and restore plan must be on the top of every administrative DBA's list of tasks. 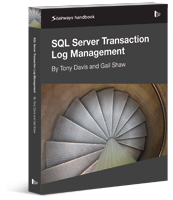 In this book, you'll discover how to perform each of these backup and restore operations using SQL Server Management Studio (SSMS), basic T-SQL scripts and Red Gate's SQL Backup tool. Capturing backups using SSMS or simple scripts is perfectly fine for one-off backup operations, but any backups that form part of the recovery strategy for any given database must be automated and you'll also want to build in some checks that, for example, alert the responsible DBA immediately if a problem arises. The tool of choice in this book for backup automation is Red Gate's SQL Backup Pro. Building your own automated solution will take a lot of work, but we do offer some advice on possible options, such as PowerShell scripting, T-SQL scripts and SQL Server Agent jobs. Three SQL Server MVPs provide fascinating insight into the most common SQL Server problems, why they occur, and how they can be diagnosed using tools such as Performance Monitor, Dynamic Management Views and server-side tracing. The focus is on practical solutions for removing root causes of these problems, rather than "papering over the cracks". SQL Server Hardware will provide the fundamental knowledge and resources you need to make intelligent decisions about choice, and optimal installation and configuration, of SQL Server hardware, operating system and the SQL Server RDBMS. Holger Schmeling's work in SQL Server Distribution Statistics was first published as a pair of long articles for Simple-Talk. The booklet takes a practical, and well-informed approach to a subject that is not always easy to explain or understand. A Distribution Statistics object is a sampled map of the distribution of data in a table. Such statistics help the Query Optimizer of SQL Server's Database Engine to translate the 'logical' SQL Query into the best strategy for doing all the physical operations of joining, sorting, and selecting the data. Most of the time, this work happens effectively without the database administrator having to be aware of what is going on, but occasionally, if the statistics no longer reflect what is actually in the table, then queries can suddenly run grindingly slow. At this point, the DBA must intervene to correct the problem. Holger divides his work into two parts. In the first part, he explains what 'statistics' are, why they are there, how they are created, updated and removed. He shows how to inspect them and to maintain them. In the second part, he lists all the problems that are related to these statistics objects, and how to solve them. Dynamic Management Views (DMVs) are a significant and valuable addition to the DBA's troubleshooting armory, laying bare previously unavailable information regarding the under-the-covers activity of your database sessions and transactions. Why, then, aren't all DBAs using them? Why do many DBAs continue to ignore them in favour of "tried and trusted" tools such as sp_who2, DBCC OPENTRAN, and so on, or make do with the "ready made" reports built into SSMS? Why do even those that do use the DMVs speak wistfully about "good old sysprocesses"? There seem to be two main factors at work. Firstly, some DBAs are simply unaware of the depth and breadth of the information that is available from the DMvs, or how it might help them troubleshoot common issues. This book investigates all of the DMVs that are most frequently useful to the DBA in investigating query execution, index usage, session and transaction activity, disk IO, and how SQL Server is using or abusing the operating system. Secondly, the DMVs have a reputation of being difficult to use. In the process of exposing as much useful data as possible, sysprocesses has been de-normalized, and many new views and columns have been added. This fact, coupled with the initially-baffling choices of what columns will be exposed where, has lead to some DBAs to liken querying DMVs to "collecting mystic spells". Millions of SQL Server instances run in the offices of small and medium-sized organizations and there are many "accidental" DBAs out there whose job it is to maintain them. Often, they find that they don't have the knowledge, experience, or critically the time, to perform the correct level of maintenance on their SQL Server databases, much as they might like to. This can mean poor performance and reduced availability. Regardless of the size of your organization, if your mission critical data becomes unavailable, then business will suffer greatly. The seventh volume in this collection brings you a compilation of the best articles we've seen over the past year, from over 50 authors. In Protecting SQL Server Data, John Magnabosco demonstrates how sensitive data, stored in SQL Server, can be protected using an efficient and maintainable encryption-based data architecture. He explains how to assess and categorize data elements according to sensitivity, regulate access to the various categories of data using database roles, views and stored procedures, and then how to implement a secure data architecture using features such as cell-level encryption, transparent data encryption, one-way encryption, obfuscation, and more. The battle to secure personal and business data is a tough one, and the consequences of mishandling sensitive data can be severe. Even more damaging than the fines and lawsuits that can be result from non-compliance with regulations, is the loss of customer confidence that results when these breaches of security occur. Database Administrators must use every weapon and strategy at his or her disposal in the "war" to protect their sensitive data from would-be hackers, phishers, rumor mongers and identity thieves. Encryption is one of the primary weapons with which this battle can be won. For the day-to-day DBA, there are dangers around every corner; monsters waiting to strike down the unsuspecting database with a resource-hungry query, an inefficient data load, or even outright data corruption. When the worst happens, and SQL Server is down, or performance is suffering, customers are quick to complain.. During such difficult periods, you, the DBA, are the centre of attention. Suddenly, three or four people crowd your desk, laser beam focused on your every action, fully expecting you to solve the problem quickly. The success of your career as a DBA depends largely on how well-prepared you are to deal with such situations. Without verified backups, sound server documentation, and a ready supply of tried-and tested troubleshooting tools, there is no safe place to hide when the monster rears up. All you can do is buy some time, patch things up as best you can and then duck away into your cubicle, which, if you lost any data in the process, may soon be empty. However, with the tools and techniques provided in the SQL Server Tacklebox, you will be fully-equipped to fight back. Inside, you'll find scripts that will allow you to automate and standardize SQL Server installation, document and report on your servers, migrate data and manage data growth, troubleshoot performance issues, receive notifications of impending danger, secure access to your servers and fight off data corruption. In short, you'll be able to respond quickly and professionally to the many issues that blight the waking, and often sleeping, hours of the DBA. Then, one day, who knows? That cubicle may turn into an executive office with wall-to-wall tinted windows revealing a flowing brook outside, where no monsters live. This book is not about the technical aspects of being an Exceptional DBA. There are already many good resources available on this topic. This book is a career guide that will show you, step-by-step, specifically what you can do to differentiate yourself from the crowd, so that you can be an Exceptional DBA. While I focus on how to become an Exceptional SQL Server DBA, the advice in this book applies to any DBA, no matter what database software they use. Challenge you in a variety of ways about the different aspects of SQL Server. Some of the questions are arcane, some very common, but you'll learn something and the wide range of questions will help you get your mind agile and ready for some quick thinking. This version is a compilation of SQL Server 2005 and SQL Server 2008 questions, to bring you up to date on the latest version of SQL Server. So read on, in order, randomly, just start going through them, but do yourself a favor and think about each before turning the page. Challenge yourself and see how well you do. SQL Server Profiler records data about various SQL Server events. This data is stored in a trace file and can be used to troubleshoot a wide range of SQL Server issues, such as poorly-performing queries, locking and blocking, excessive table/index scanning, and a lot more. For such a potentially powerful tool, Profiler is surprisingly underused. This must be due, at least in part, to the fact that it is occasionally a frustrating tool. The user interface is poor, it lacks many important features, it is poorly documented and, unless you have a lot of experience as a DBA, it is often hard to analyze the data you capture. As such, many DBAs tend to ignore it and this is distressing, because Profiler has so much potential to make a DBA's life more productive. This book will make it easier for you to learn how to use Profiler, analyze the data it provides, and to take full advantage of its potential for troubleshooting SQL Server problems. Спасибо за комментарий, поправил ссылку. А есть литература на русском языке ?